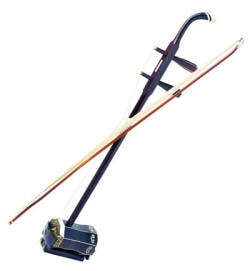 Erhu 二胡, also known as two-string violin, the erhu is a Chinese 2-stringed, vertical fiddle that has a history of more than 1000 years. 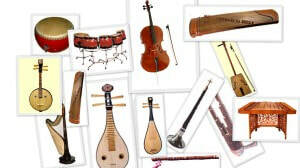 The first Chinese character of the name of the instrument, èr (meaning “two”), is believed to come from the fact that the instrument has two strings. With a range of about three octaves, it’s sound is rather like a violin, but having a more nasal tone. It has a small body and a long neck. There are two strings, with the bow inserted between them. There is a vertical post with a fingerboard, which goes through the sides of a resonator at its base. This resonator is covered with a piece of stretched snakeskin (python), which results in the unique “whining” tone color of the instrument. The erhu is almost always tuned to the interval of a fifth. The inside string (nearest to player) is generally tuned to D4 and the outside string to A4. This is the same as the two middle strings of the violin. The erhu is usually played sitting down placed on the top of the left thigh. In some contemporary styles, erhu is also be played in a standing position.